Will Virat win the World Cup? India and England will play the cricket World Cup final where England will be bowled out for 115 runs and India chases it in 15 overs without losing a single wicket. That's how batting legend Sunil Gavaskar hopes to see the outcome of the cricket World Cup 2019, scheduled to be held in England later this year. 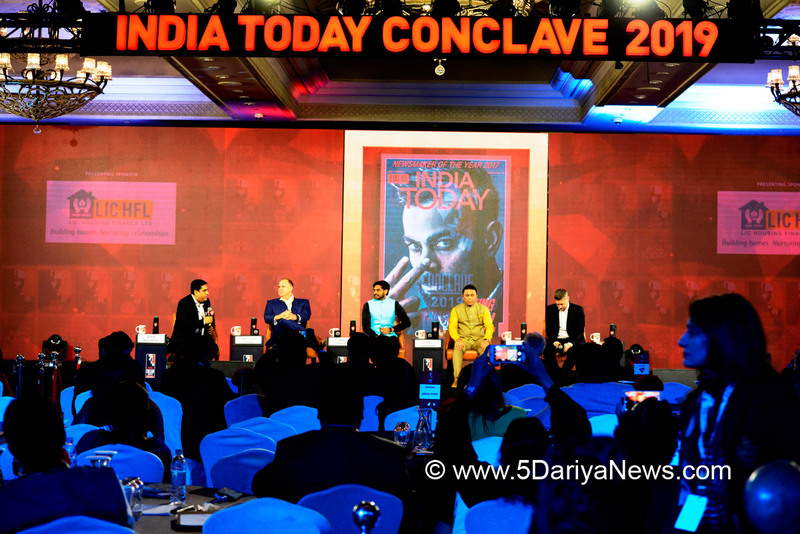 The former Indian captain was speaking at the India Today Conclave 2019 held in Delhi Today. He was participating in a session titled How’s the Josh: Will Virat win the World Cup?. Former Australian Cricket Captain Michael Clarke, head of Indian selection board MSK Prasad, and former Australian cricketer Mathew Hayden were the co-panelists in the session which had some exciting analysts by these stalwarts.While Gavaskar rooted for a India England final, Hayden and Clarke said that they would like to see an India Australia final. "Australia will win by one run," said Clarke. Hayden felt that Australia would beat India by 2 runs.Prasad was more diplomatic and said that the team with the right mix and intensity would win the world cup. "The Indian team has it at the moment," he sair. He however said that IPL would not adversely affect the preparation of the players who would play in the World Cup. "IPL is an Indian international tournament which offers so many complex situations. It's better than the training ground and creates a competitive environment," he said. Clarke, however, criticised the Indian team's approach in the last two T20 games against Australia that India lost. "The team was experimenting without thinking much about winning or losing. I personally believe that it's important to win every game and build the momentum," said Clarke.Gavaskar said that MS Dhoni's presence in the team as wicketkeeper batsman gives Virat an edge. Prasad said that the country should appreciate the chemistry between Dhoni and captain Virat Kohli as the captain allows his former skipper to set fields. Gavaskar added that Kohli also had the advantage of world class bowlers. "Virat has a kind of attacking bowlers who keep taking wickets that no Indian skipper had in the past," said Gavaskar.The former Indian skipper felt that if India play Pakistan in the world cup the players would not get bogged down by the current tension prevailing between the two countries. "Our players are professional, they will not be swayed by the current political situation. That's the sign of a great team. They forget every other thing and focus on the game," he said. Clarke agreed adding that players do feel the emotions but they have to do the job. "Cricket is a silly game. No matter what happens outside, players focus on the job at hand. Batters focus on batting, bowlers on a good delivery and fielders on chasing the ball," he said.Gavaskar's secret: "I always took the first strike a Test match because the first ball was a loosner and always had the opportunity to score. Scoring the first run was important because I was scared of getting a pair in a Test match which means getting out for zero in both innings. I never got a pair in my career. "